As many of you are aware, our unit AI sometimes chooses the wrong walls to attack on the way to an enclosed target. This most often affects Hulks and other large melee units. Our dev team has come up with a proposed solution that we think will fix this problem. We are deploying it as a Settings menu option for now, so we can get your feedback and decide if further changes might be necessary. Turn it On to enable the fix. You can turn it Off at any time to go back to the old AI. Note: this setting affects your own units only, it does not affect enemy units that come to attack your base. Please try this out and post here to let us know what you think! Video to follow, experimental AI is worse. Like, SUPER BAD. Video to be edited in when it finishes uploading etc. Troops now randomly break off attacking building before they are destroyed to walk across the entire screen. Some of the ones left behind then freeze in place. Hulks had a choice to go for a close tower behind a damaged wall, or a further one behind an undamaged wall. 2 guesses which one they went for? Your first guess does not count. Pretty much given up on this game. Unless there is an improvement in AI and/or replays, I won't be back after a week. Hi Phoenix - thanks for the video! Definitely looks like a bug there with the units stuck marching in place. I'll take this back to the team. Hi Bloodrayne - Can you post a screenshot of a situation where the Hulks are attacking the wrong wall? Update: thanks to the videos posted here, we've been able to make some additional tweaks that should reduce the chance of melee units getting stuck "marching in place". 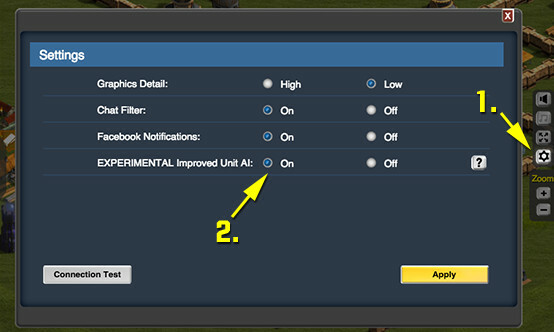 Please try the "EXPERIMENTAL Unit AI v2" option when you have a chance, and post about any further issues here. Appreciate your help! Getting stuck is still occuring, no video. I didn't notice until the end. The troops were in the process of running around some walls to a target, that target was destroyed and they stayed put, rather than retargeting.